U shaped neck pillows ventilated for extra cervical spine support. The vents form ergonomic areas without increasing firmness and while supplying better air circulation. Memory foam that is very soft, yet supportive and options for natural aromatherapy infusions like lavender, peppermint and chamomile. 11″ by 12″ with a thickness of 4″. The subtle aromatherapy pillows use a mesh Tencel cover – a botanical fabric which is a soft, silky, and breathable. It promotes air flow and aromatherapy scent release. Our most popular u shaped neck pillows with a supporting u-shape design, ventilated specifically for extra support for the cervical spine. The vents form ergonomic areas that offer added neck support without increasing firmness, and while also supplying better air circulation. Memory foam that is very soft, yet supportive and options for natural aromatherapy infusions like lavender, peppermint and chamomile. 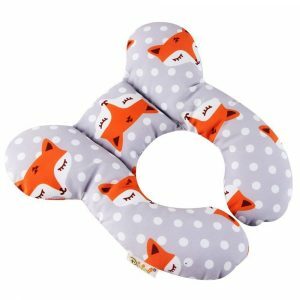 All the u shaped neck pillows are 11″ by 12″ with a thickness of 4″. The subtle aromatherapy pillows come with a mesh Tencel cover that is a botanical fabric which is a soft, silky, breathable fabric that is great at wicking moisture and controlling temperature. It promotes air flow and aromatherapy scent release. You will enjoy the comfort and support of the U shape pillows at home or when traveling. The memory foam is soft, allows air to flow and remains cool, yet supportive. The comfortable density allows for superior properties in conforming to your unique shapes and curves. We call the special memory foam in all the u shaped neck pillows “Dough”. Easily compresses for compact travel anywhere. Use in your favorite lounge chair, on airplanes, cars, buses and more. The special venting extends through the pillows, providing air ventilation and more comforting support as the U shape wraps comfortably around the neck, eliminating points of pressure to ease pain and stiff muscles. 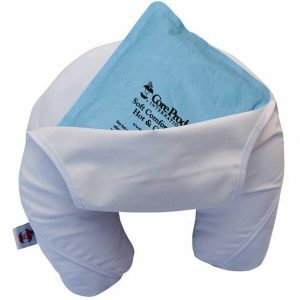 A supportive, ergonomically designed travel pillow in a traditional horse-shoe shape to cradle the head, neck & shoulders. The special design produces a cooler and softer memory foam with superior pressure point relieving properties. Combined with the soft and cover, it is the most plush and comforting of the neck pillows, making it great for sleeping. The pillows retain the vented cervical support system and ergonomic design for keeping your neck curve supported and the muscles at ease. 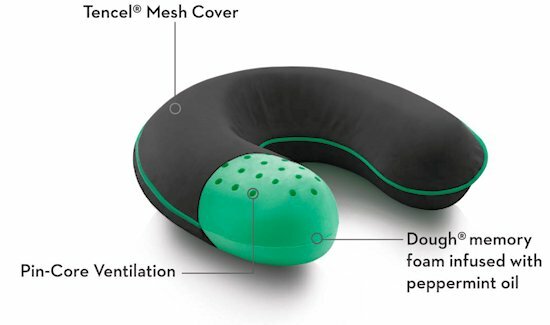 Because the foam is ventilated and not too dense, they are great as a travel or lounging pillow for those with sensitive necks. 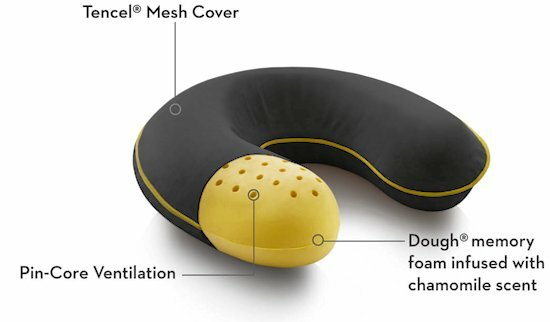 If you are not into the new fancy designs that throw in everything but the kitchen sink, this is a traditional travel pillow design with great properties for neck conditions. 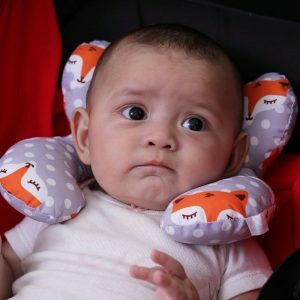 If you are looking for the best u-shaped memory foam neck pillow for reclining or sleeping, this is it. Aromatherapy with essential oils are ancient remedies that have made a modern comeback. Natural fragrances are infused in the u-shaped pillows with great comfort and neck support. Very unique and makes a great gift idea for just about anyone. Aroma is mild and not overwhelming, which is an added benefit to the truly wonderful properties of the memory foam. Roman Chamomile has a sweet, calming scent known for it’s ability to promote relaxation. 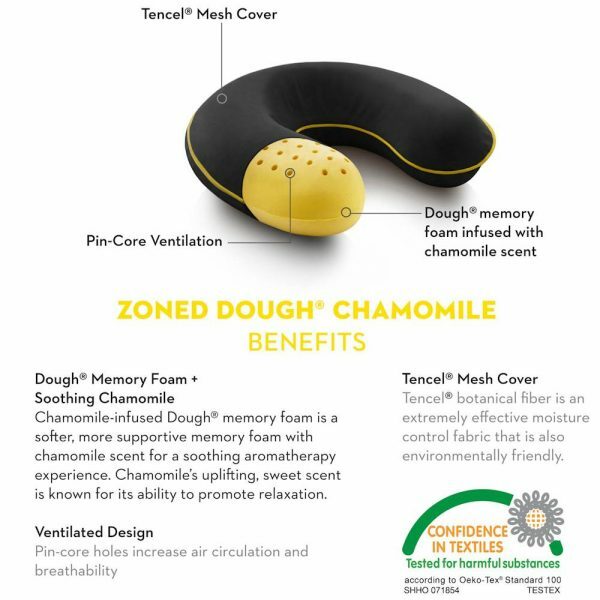 A plush and pressure easing memory foam infused with chamomile for a natural, cozy relaxation experience. Roman chamomile is known for its soothing and relaxing properties. 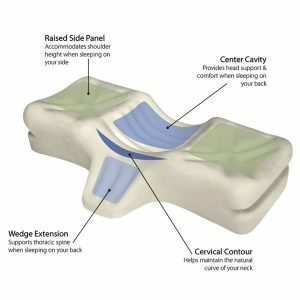 Correct ergonomic design provides the right support for the cervical spine, perfect for a more relaxed flight, ride in the car, or just lounging. Infused with real lavender, this is a popular choice, providing a calming aromatherapy for mood enhancement, better concentration and relaxation. Combine the aromatherapy with the soft Tencel mesh cover, plush memory foam and venting support and air flow properties, and you get what we feel are the best u shaped neck pillows available. Revitalize and ease tension with this u-shaped lavender aromatherapy pillow. Support and comfort meets natural peppermint aromatherapy. A plush, neck conforming memory foam a with real peppermint oil infusion for natural relaxation. Peppermint aids in clear, deep breathing and promotes mental clarity, plus peppermint is naturally antimicrobial. Venting technology construction improves support, comfort, and breathability. The soft and beautiful mesh cover enhances the naturally restoring properties. How Is The Aromatherapy Scent? The pillow is infused with natural lavender, chamomile and peppermint, it is not soaked with a fragrance, therefore; it is not like a perfume, nor is it like a sachet of fresh cut plants. The aroma is subtle, but it is there and this is the way it should be – not overwhelming. The infusion lasts a long time and becomes more noticeable the more you use the pillow. I really like this because too much fragrance is annoying. This is just enough to produce a very mild effect. So, don’t expect the aromatherapy to “knock your socks off”, it won’t, but the pillow will. This is one of my personal favorites, and I explain why below. I can tell you that this is the best u shaped pillow I have used. It has been very helpful for me personally. The density is soft. Yes, it is ergonomically correct, but the softness is wonderful! 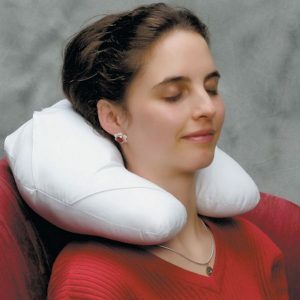 This is perfect for those with sensitive necks like mine; arthritis, neck strains and whiplash sufferers will really benefit from this pillow in any style. For reclining: Many recliners have a head support portion or an upper part that extends out or is filled more. This is pretty much standard design, even the real expensive ones. This can make using most pillows frustrating. Most are too much, placing the neck in a forward position and/or producing too much pressure. 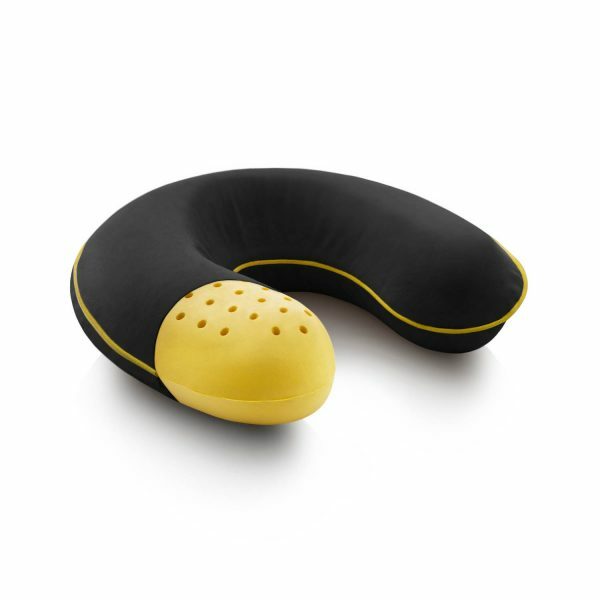 These memory foam u shaped neck pillows compensate for this and allow true ergonomic positioning. The same when traveling, some headrests are set forward. You can compensate for this by reclining the backrest of the seat some, but most headrests in vehicles are firm and not so comfortable. 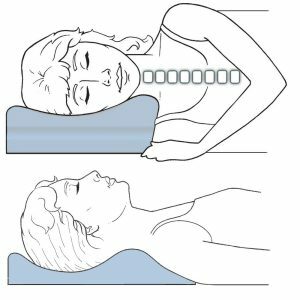 Using a firm or overly supportive pillow can be counterproductive to healing, rest and relaxation. My recommendation comes from personal experience. It has been some years since my 2 shoulder surgeries. I underwent 3 procedures during the operation. I had a rotator cuff repair (subscapularis), acromioplasty on the acromioclavicular joint, and a biceps tendonesis (cut and reattached). The second surgery was for the supraspinatus. Well, if you have ever had this experience, you may know you have to sleep in a chair after the operation. Unfortunately, sloppy physical therapy after the 2nd surgery resulted in 2 permanent tears; the subsacapularis and supraspinatus. I had purchased a nice recliner for sleeping prior to my first surgery as part of the preparation. With normal recovery, you can get back to sleeping in bed fairly soon. Unfortunately, with permanent tears, I sleep in a recliner permanently. Well, I needed a pillow that would work to support my neck and be comfortable enough to actually sleep for long periods. I looked at all the available pillows and first used fiber based ones. It was difficult right after the surgery because of the pain, and I mean PAIN. Eventually, when dealing with the pain was not the prime factor, the pillow was. The one I could unzip, I kept taking out some of the fiber to get my neck comfortable. It was late summer and I was surprised how much the fiber retained heat. I tried another fiber based one and another – same problem, but the others were not zippered, so I could not take some of the fiber out. Next I used a memory foam one and it was way too firm. Tried a cheap store bought one and it was soft enough, but quickly lost it’s support, fell apart and became useless. Finally, this version of the u shaped neck pillows was perfect! I have used the lavender one ever since and was very pleased and able to get a better night’s sleep. It really saved my neck. They nailed it with this one! I’m a big fan and highly recommend this pillow in any style – I like the lavender, but they are all the same great quality and feel. It did not build up heat like the cheaper memory foam or fiber ones. So, I feel these are the best u shaped neck pillows for sleeping. They do not tie around your neck or have bulky side areas for head control. Made to last for years! The special memory foam does react to temperature changes, getting softer with heat and firmer with cold, although not extreme like most. Your body heat will help mold, soften and shape the pillow. Do not use any form of heat other than your body temperature on the pillow to avoid damage and voiding the manufacturer 5 year warranty. If your pillow is very cold, allow it to warm up to the ambient temperature before use. Any residual manufacturing odor is not harmful and dissipates quickly. For those who are sensitive, just air it out for 24 hours and this will speed up this process. 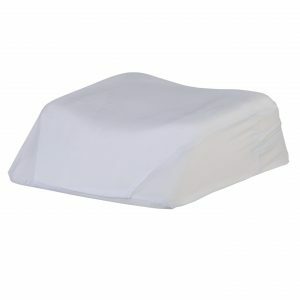 The pillow is naturally anti-microbial and non-allergenic, without harsh chemicals associated with foam manufacturing. Follow the included instructions with all the u shaped neck pillows, however, you can spot clean the pillow by hand, avoid soaking or using high suds detergent. Allow to dry away from heat or light at room temperature. 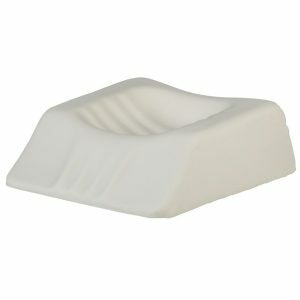 A great addition to and the same great aromatherapy memory foam in the sleeping pillows and side sleepers.